Topped with lavender buds, this handcrafted artisan soap is scented with lavender fragrance. Made with lots of good for your skin ingredients, Lavender soap from The Lathered Lamb includes silk for luxurious lather. This pretty soap has a lavender purple swirl and weighs 4.5 ounces. Pamper yourself with this handmade luxury soap bar which will gently clean your skin without leaving it feeling dry and itchy. Simple pleasures, simply soap. 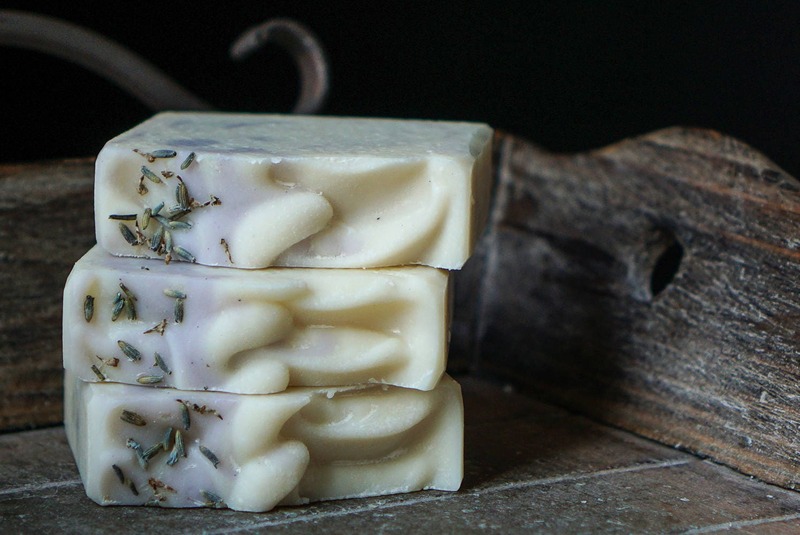 Lavender soap was made using the cold process method of soap making from scratch. No harsh detergents or strange chemicals are used. Natural glycerin is retained. 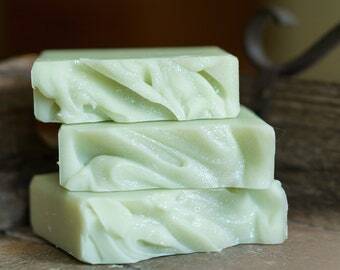 Glycerin draws moisture to the skin and is one of the benefits of handmade soap. Most commercial soaps remove the glycerin for use in other products. 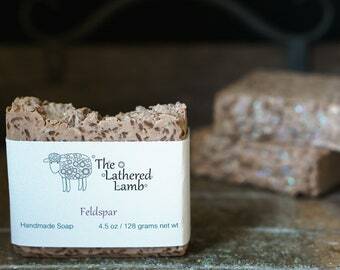 Lavender soap from The Lathered Lamb retains the natural goodness of the fine ingredients that went into making it. 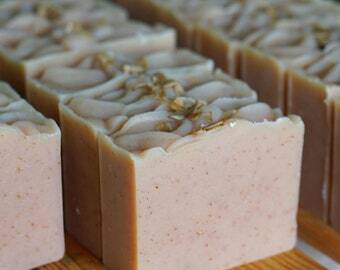 Handcrafted artisan soap makes a sweet gift for someone special, including yourself. Perfect for thank you or bridal shower gifts, stocking stuffers, or teacher appreciation. Live Simply. Use Soap. I love my Soap Saver Pouch! The seller was friendly and helpful. I requested custom colors, asking for either blue or black. I assumed it would be all one color, but the seller used both, which looks great! I love it! I finally got to try it out and it works perfectly. I can work up a good lather then rinse the bag off and hang it up so my soap doesn't dissolve. It stretches a good bit when hung (which is to be expected - I have a pretty big bar of handmade soap in it) but feels sturdy like it will last. I plan on ordering a few more in the future so I can cycle them out when one is in the wash. I had a great experience with this seller and received a great product - highly recommend! Just what I wanted. I like this pattern and the edge it has around it. Will be ordering more in the future. I love these knit dishcloths, they are very well made. Thank you! I love these knit dishcloths so much I gave them as a gift to a friend. I knew she would love them too so I got a couple other colors. These are extremely well made.